Dr. Selçuk Gürışık, who has been maintaining his experimental studies on traditional Anatolian Felt Making with success for twenty eight years, he is in art scene again with a new exhibition once more he is after a long break. 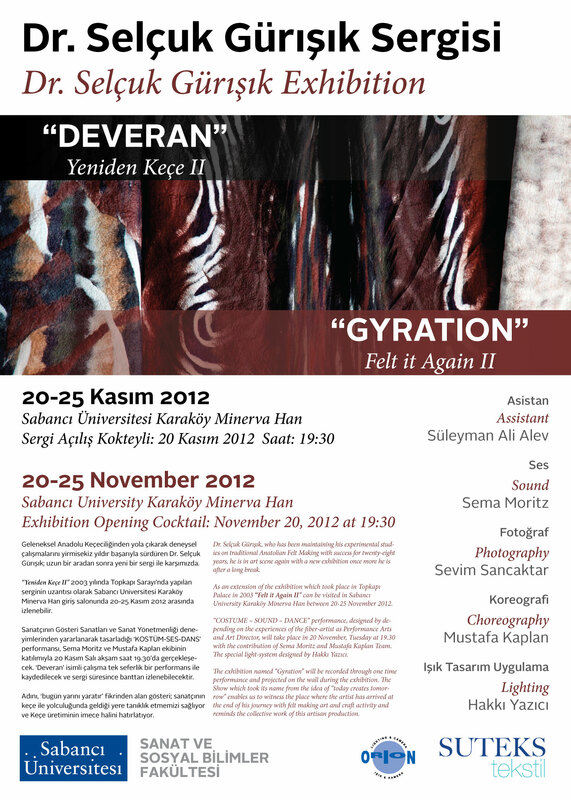 As an extension of the exhibition which took place in Topkapı Palace in 2003‘ Felt it Again II’ can be visited in Sabancı University Karaköy Minerva Han at the in 20 – 25 November 2012. “COSTUME – SOUND – DANCE” performance, designed by depending on the experiences of the fiber-artist as Performance Arts and Art Director, will take place in 20 November, Tuesday at 19.30 with the contribution of Sema Moritz and Mustafa Kaplan Team. The special light-system designed by Hakkı Yazıcı. The exhibition named “Gyration” will be recorded through one time performance and projected on the wall during the exhibition. The Show which took its name from the idea of “today creates tomorrow” enables us to witness the place where the artist has arrived at the end of his journey with felt making art and craft activity and reminds the collective work of this artisan production. Selçuk Gürışık, through his researcher, designer and academician identities brings a new perspective on the status of the Objects in social life. The products, through the perceptions and thoughts they trigger further more their apparent values, visible qualities also create a desire to possess. This study which emphasizes that we can never fully possess an object but instead only formalize the memories of togetherness with that product inside this Gyration tries to create spirituality with the objects beyond material.